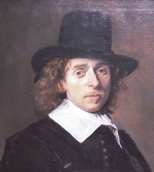 According to Houbraken, he and his brother were pupils of Frans Hals and like him, spent most of their lives in Haarlem. He thought they were "Lubekkers" by birth, though this has since found to be false He was the eldest son of Jan Hendricx Ostade, a weaver from the town of Ostade near Eindhoven Although Adriaen and his brother Isaack were born in Haarlem, they adopted the name "van Ostade" as painters. According to the RKD, he became a pupil in 1627 of the portrait painter Frans Hals, at that time the master of Adriaen Brouwer and Jan Miense Molenaer. In 1632 he is registered in Utrecht (where, like Jacob Duck, he was probably influenced by the village scenes of Joost Cornelisz Droochsloot, which were popular in his day), but in 1634 he was back in Haarlem where he joined the Haarlem Guild of St. Luke. At twenty-six he joined a company of the civic guard at Haarlem, and at twenty-eight he married. His wife died two years later in 1640. In 1657, "as a widower", he married Anna Ingels. He again became a widower in 1666. He opened a workshop and took on pupils. His notable pupils were Cornelis Pietersz Bega, Cornelis Dusart, Jan de Groot (1650-1726), Frans de Jongh, Michiel van Musscher, Isaac van Ostade, Evert Oudendijck, and Jan SteenIn 1662 and again in 1663 he is registered as deacon of the St. Luke guild in Haarlem. In the rampjaar (1672) he packed up his goods with the intention of fleeing to Lübeck, which is why Houbraken felt he had family there He got as far as Amsterdam, however, when he was convinced to stay by the art collector "Konstantyn Sennepart", in whose house he stayed, and where he made a series of colored drawings, that were later bought for 1300 florins (along with some drawings by Gerrit Battem) by Jonas Witsen, where Houbraken saw them and fell in love with his portrayals of village life.Jonas Witsen (1676-1715) was the man who convinced Houbraken to move to Amsterdam from Dordrecht. He had been the city secretary, and was probably his patron. His successor, Johan van Schuylenburgh, who became city secretary in 1712, was the man to whom Houbraken dedicated the first volume of his Schouburg.